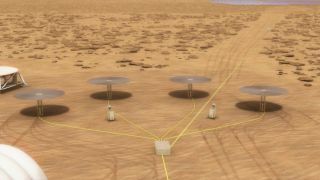 Artist's illustration of the umbrella-like heat radiators of four Kilopower nuclear reactors casting shadows on the Martian surface. Patrick McClure is the Kilopower project lead at the U.S. Department of Energy's Los Alamos National Laboratory in New Mexico. David Poston is the chief reactor designer, also at Los Alamos. They contributed this article to Space.com's Expert Voices: Op-Ed & Insights. When we imagine sending humans to live on Mars, the moon or other planetary bodies in the not-so-distant future, a primary question is: How will we power their colony? Not only will they need energy to create a habitable environment, they'll also need it to get back to Earth. For distant planetary bodies, like Mars, it's inefficient to bring fuel for the trip home; it's just too heavy. That means the astronauts need a power source to make liquid oxygen and propellant. Enter Kilopower, a small nuclear reactor designed at Los Alamos National Laboratory in conjunction with NASA that the agency hopes will one day power a colony on Mars, the moon or beyond. The brilliance of Kilopoweris its simplicity: With few moving parts, it uses heat-pipe technology, invented at Los Alamos way back in 1963, to power a Stirling engine. Here's how it works: The sealed tube in the heat pipe circulates a fluid around the reactor, picking up the heat and carrying it to the Stirling engine. There, the heat energy pressurizes gas to drive a piston coupled to a motor that generates electricity. Using the two devices in tandem creates a simple, reliable electric power supply that can be adapted for space applications, including human exploration and space science missions to outer planetary bodies like the moons of Jupiter and Saturn. Kilopower reactorsrange from 1 kilowatt — about enough to power a household toaster — to 10 kW. To effectively run a habitat on Mars and create fuel, about 40 kW would be needed, so NASA would likely send four to five of the reactors to the planet's surface. The advantages of nuclear power are that it's lightweight and reliable. Other energy sources either require too much fuel — making them too heavy — or can't be counted on in all seasons. Solar power, for example, relies on consistent sunlight. That's something that's lacking on Mars, since it depends on the time of day, the time of year, the location on the planet surface and the severity of the planet's dust storms, which can last for months. Nuclear energy operates regardless of the weather or time of day. Also, the number of solar panels and batteries required would once again make the rocket to Mars extremely heavy — requiring more fuel. Experiments to test Kilopower — called KRUSTY (Kilopower Reactor Using Stirling Technology) — began late last year at the Nevada National Security Site (NNSS) and will culminate with the test of a flight-like reactor core at full operating temperature this spring. In addition to Los Alamos, NASA and NNSS, the experiment is being conducted in collaboration with NASA's Glenn Research Center, the Marshall Space Flight Center and the Y-12 National Security Complex, along with NASA contractors SunPower and Advanced Cooling Technologies. The work on this technology is not new. KRUSTY builds on a 2012 experiment conducted by a team from Los Alamos, NNSS and Glenn that demonstrated the first use of a heat pipe to cool a small nuclear reactor and power a Stirling engine. These new experiments build on the knowledge we gained from that experiment. As we look to the future, the potential for nuclear energy to bolster plans for a long-term habitat on other planetary bodies is pretty extraordinary. While powering a colony is only one of the many complex technical questions that must be answered when we think about sending humans to other planets, it's a critically important one. Kilopower could very well be the answer. We're excited to see where it will take us.